Solid Ground’s food programs work with children, families and community groups to support healthier places, communities and stories. We recognize that hunger and health disparities exist not due to lack of sufficient food, but to inequities built into the food system which disproportionately impact communities of color. Through our Community Food Education programming (cooking and nutrition classes in schools, gardens and community organizations) and our Food System Support efforts to build equity in Seattle’s emergency food system, our food programs work with communities to break down barriers to leading healthful, thriving, independent lives. Across all of this work, we challenge ourselves to use an anti-oppression lens to build more equitable systems and healthier communities. Solid Ground works with people experiencing food insecurity to learn about, access and cook healthy foods on a budget. Of the 3,000 people who access our Community Food Education programs each year, 70% are people of color. 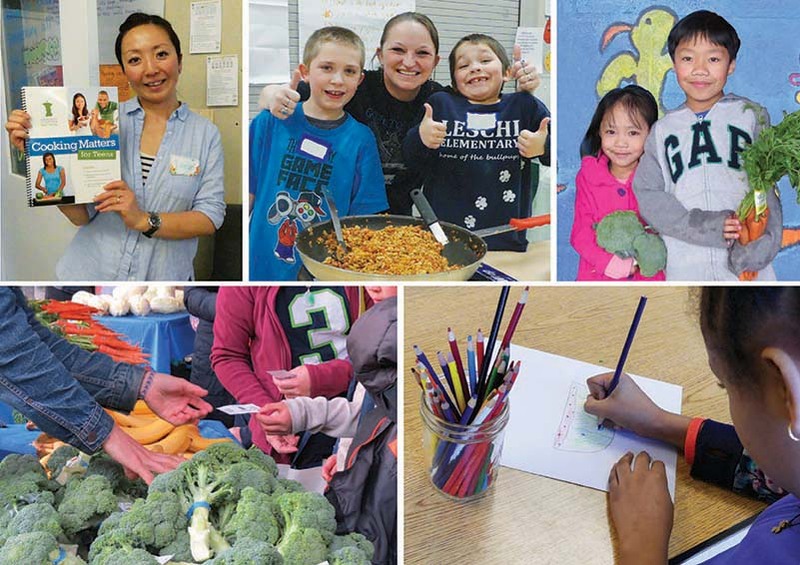 So our Community Food Educators start early, teaching 6-week cooking and nutrition class series for 2nd–5th graders in three South Seattle schools. The concept of food justice is hard enough for adults to wrap their heads around, let alone children – so framing is important. Students talk about barriers families may face in accessing fresh and healthy foods, and learn tips to help work around them. They learn how companies market unhealthy foods to kids – and how it’s possible to eat healthfully on a budget. Concepts are reinforced at Family Market Nights, where each family gets “Market Money” to “buy” fruits and veggies to take home. On a systemic level, our Food System Support team works within the emergency food system to provide on-the-ground, logistical support and training – striving to bring an anti-oppression lens to Seattle’s emergency food providers. We staff and support the Seattle Food Committee, a coalition of Seattle food banks that advocates for equity in food bank distributions and culturally relevant foods for food assistance programs. In schools, we work with students, families and staff to change or strengthen policies and systems within the school to encourage health and wellness. And at our Giving Garden at Marra Farm in the South Park neighborhood, where nearly 70% of residents are people of color (4), we offer field trips, summer sustainable gardening classes, and a work/trade program where neighbors who volunteer can take home fresh vegetables. We also collaborate with nearby neighborhood organizations to bring childcare classes to the garden, and last summer we piloted a fresh food project with physicians to bring produce directly to Sea Mar Community Health Center clinic patients. This is the lead article from Solid Ground’s April 2018 print newsletter. To sign up for email updates, Groundviews Blog email notifications, or to receive the print newsletter by snail mail, visit our Get News & Updates page.